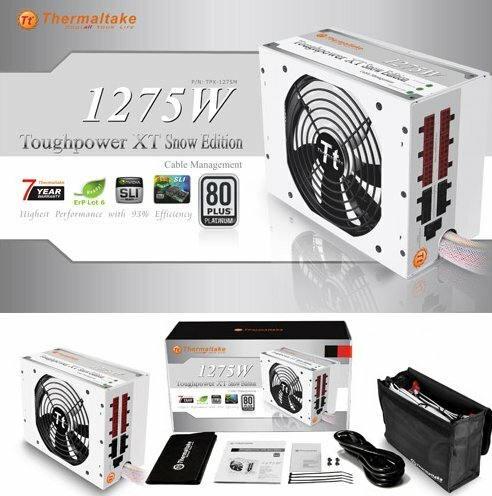 ThermalTake delivers the Toughpower XT 1275W Platinum Snow Edition power supply, full specs can be found over here. Thermaltake, an award winning state of art PC power supplies, the leader and pioneer in PC thermal solutions, a worldwide designer and supplier of high-performance components to the PC gaming hardware market, with “delivering the perfect user experiences” as our mission, today announced the new Toughpower XT 1275W Platinum Snow Edition, a white color scheme of the series, defining the performance and style of power supply unit for enthusiasts. Continued with the success of Toughpower XT Platinum & Gold series, the new Thermaltake XT 1275W Platinum Snow Edition has also earn the certification of 80 Plus Platinum, promise to deliver up to 94% high power efficiency and provides the high quality, reliability and true wattage power for enthusiasts’ system. Featuring the Full Bridge and LLC resonance with DC-DC module and interleaved PFC circuit designs that provide a high reliability and efficiency. In addition, 100% 105°C Japanese electrolytic and solid capacitors deliver an unbeatable stable power and performance while the machine is constantly consuming on high wattages in every environment. Moreover, the high current dual +12V rails will electrify and support up to 4-way NVIDIA SLI ™ and 4-way AMD Crossfire ™ without any dilemma. The unique S.P.T indicator shows PSU status with 3-mode LED (Standby/ Power good signal/ Temperature) that checks the PSU status instantly. Besides, the built in 14cm dual ball bearing fan with three modes Smart Fan Control system ( Fanless mode, Silent mode, & Cooling mode) that automatically detects the PSU ambient temperature and adjusts fan mode & speed to create the smooth airflow and achieves the optimal thermal performance. Better yet, the Toughpower XT 1275W Platinum Snow Edition comes with full white modularized cable management for easy customized support and various peripheral settings. Who says PC system could not be trendy from within? Now, with the availability of Toughpower XT 1275W Platinum Snow Edition, enthusiasts could own a magnificent system with style from the interior.